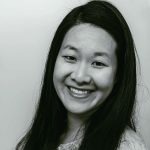 Published Nov 29, 2018 By Julia Leave a CommentThis post may contain affiliate links. These parmesan crisps are a crunchy and savory low carb snack. All you need are two ingredients and an oven. 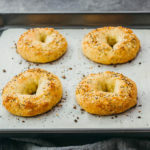 Great for anyone on a gluten free or keto diet. These low carb chips are very thin and super crunchy. They also have a gorgeous lattice pattern. As the parmesan cheese bakes, it starts to bubble throughout the surface. Air gaps are formed by the bubbling activity, yielding a lattice pattern as moisture escapes and the cheese crisps up. I have made these crisps accidentally in the past; it’s happened when cheese spills over on my baking sheet. I figured I might as well make them intentionally. They remind me of cheese chips sold by Whisps or Trader Joe’s, except these homemade ones taste better! When the cheese bakes, it will bubble as it releases steam. The crisps are done when the bubbling activity drops noticeably, indicating that much of the liquid content has been simmered off. That means it’s getting dry and crisp, and you should remove them from the oven at that point. My oven takes 7 to 8 minutes to reach optimal crispness. I usually bake closer to 8 minutes because I prefer an extra crispy texture. Plus, the garlic flavor becomes more pronounced — almost a bit charred — which I really like. 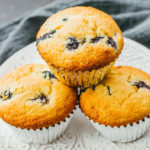 Depending on your taste preferences and your particular oven, you may want to experiment with shorter or longer baking times. 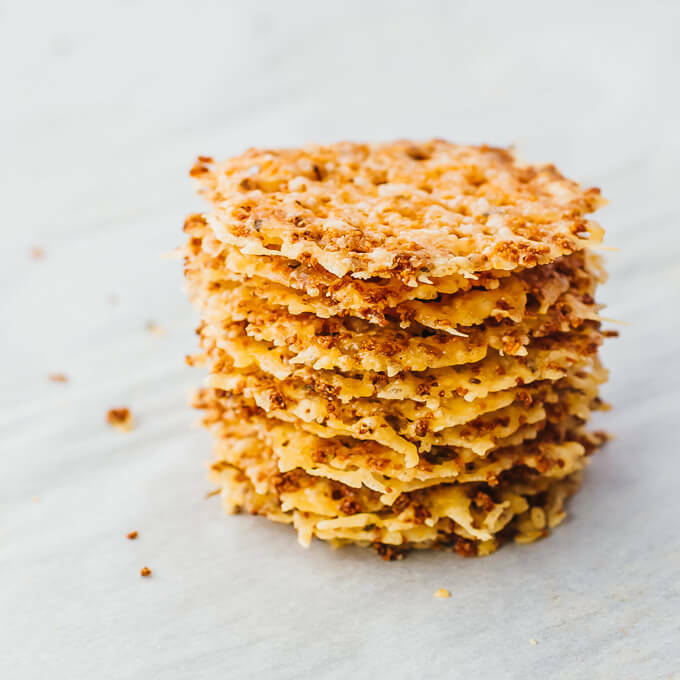 If the crisps do not come out as crispy as you’d like, increase the baking time by 1 minute. The longer you bake, the crisper they will get. Careful not to burn them! I highly recommend using a nonstick surface to line the baking sheet, such as parchment paper or a silicone baking mat. After baking, the cheese crisps will slide right off. You may have a hard time without a nonstick surface. Note that wax paper is not the same as parchment paper, and shouldn’t be used in the oven. I love garlic, so it was an obvious choice to make garlic flavored cheese crisps. For reference, I used a garlic powder blend by Kirkland that includes dried parsley. 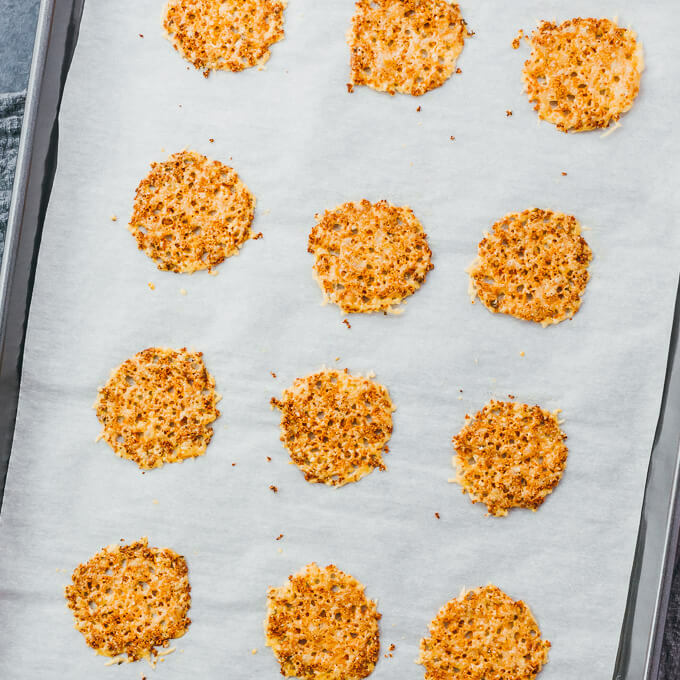 Don’t forget — you can always skip the seasoning and just make plain parmesan crisps. They’re delicious by themselves. 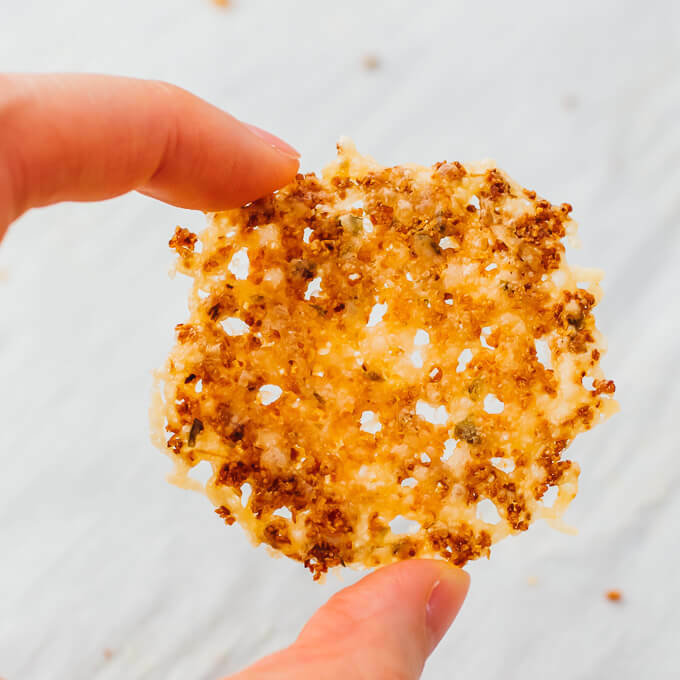 You can use these parmesan crisps for dipping into anything. Just pretend they’re chips. Dip them into guacamole, salsa, or spinach dip. Or you can serve them with soups and salads. I recommend cauliflower cheese soup, split pea soup, or chicken salad. 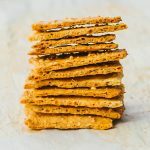 They’re also fabulous as a standalone low carb snack, which is how I usually enjoy them. Generally, cheese is quite low in carbs, but it varies with the type of cheese. 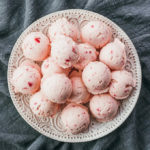 It’s a popular snack and ingredient for many people on a keto diet. Note that it’s not zero carbs, because cheese isn’t pure protein and/or fat. Manufacturer nutrition labels often include rounding, so even if the label says 0, it doesn’t mean it has no carbs. Heavy whipping cream is a common example of this. According to the USDA’s basic nutrient report, parmesan cheese has 0.91g of total carbs and 0g of fiber per 1 ounce serving. So while any cheese-based snack is certainly low in carbs, don’t be fooled into thinking it’s a no carb snack. The carbs in parmesan cheese and garlic powder are reflected in the nutrition facts in the recipe below. Preheat the oven to 350 F. Prepare a baking sheet lined with a nonstick silicone baking mat or parchment paper. 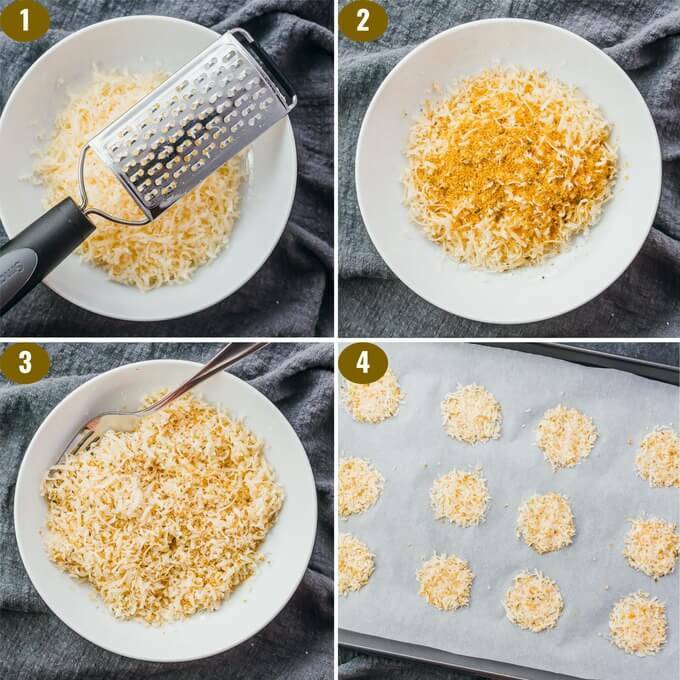 Grate the parmesan cheese, ending up with 1/2 to 2/3 cup of grated cheese. In a bowl, use a fork to mix grated cheese with garlic powder until well-mixed. 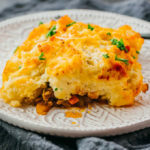 Scoop a little less than 1 tablespoon of the cheese mixture onto the lined baking sheet. Gently flatten and shape into a 2-inch circle. Repeat until the mixture is used up, yielding about 12 crisps, spaced about 1 inch apart. Bake at 350 F until golden and crisp, 7 to 8 minutes. Let it cool for a few minutes so that the bubbling subsides. Remove the crisps from the baking sheet and serve while crispy. 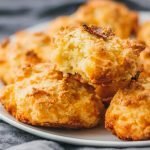 This recipe yields 2.5 g net carbs per serving (6 parm crisps or half of the recipe).